Redneck Liberal: Arkansas Executions, An Early Christmas for Conservatives. 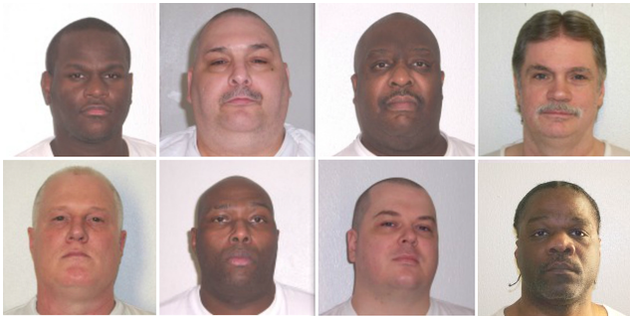 Arkansas Executions, An Early Christmas for Conservatives. Now, I'm not saying these guys aren't guilty or even that they don't deserve death, however I am saying that governments that kill their own is not a good thing, for obvious reasons. I live right next door to Arkansas in Oklahoma and I have noticed that conservative government officials seem to exhibit a tad too much glee when execution time nears. But conservatives certainly don't want to be considered squishy liberals, so one way to prove their he-manliness to their fellow conservatives is by killing things and parroting what they hear on Fox "News" to each other to show their supposed intellectuality to each other. Now as for the "killing things" part, I understand it because when I was a kid, I'd get off the bus, walk down the driveway, go in the front door, throw down my books, grab my shotgun or .22, head out the back door and kill things and I killed many things, I thought this was a rite of passage, something you had to do to be considered a man, but I was young and incredibly stupid. "I have a responsibility to the voters, I have a responsibility to my oath of office, but I also have responsibility to a higher power, God and eternity, and I understand that," he said. "I feel comfortable in my understanding of my responsibilities both in terms of faith and scripture and in terms of as governor. I'm sure he's referring to that passage in the New Testament where Jesus says, "Damned straight, kill 'em all! You're a bunch of pussies if you don't." Attorney General Leslie Rutledge who describes herself as a "Christian, pro-life, gun carrying, woman" which, no doubt, caused the most erections in Arkansas since Sarah Palin, is just all a-holes and elbows making sure the Lord's work is done to send these cons to hell. You know, I believe it would be a good idea if we just let these good Christians do it like they did in the good old days, bring these guys to the state capitol, order a couple of truckloads of bricks, charge twenty bucks a brick and just stone the hell out of 'em. You're pussies if you don't.